We're Putting on a Live Stage Show! By Norman Chan on Sept. 24, 2014 at 7:26 p.m. Here's your chance to watch the stuff you like on Tested, live on stage. Update: Tickets are now open for everyone to purchase! You can buy them here. See you next month! Hey everyone! Will and I have something exciting to announce. On Saturday, Oct 25th, as part of the Bay Area Science Festival, we're putting on our very first live event at San Francisco's historic Castro theater. It's called Tested: The Show (remember that?) and it'll be an afternoon of presentations, demos, and conversations with some of our favorite people about the culture of making and technology's role in it. This is the first time we've done anything like this, so we thought a bit about how we could best present the type of stuff we do on Tested--showcasing awesome maker project, geeking out about technology, 3D printing, and more--on stage to a live audience. We don't want to give away too much yet, but you're going to see familiar faces like Game Frame creator Jeremy Williams and The Zoidberg Project's Frank Ippolito show off what they're working on today. And just wait until you see what Jamie has to show. For those of you who can make it, we'd love for you spend the afternoon with us on October 25th. We're opening ticket sales tonight to Tested Premium Members first (check your email for instructions!) and will be putting tickets on sale to the general public this Wednesday evening. We know that not all of you will be able to make it to San Francisco, so we're going to be recording the entire show and putting it up on the site (and on YouTube) as soon as we can after the event. This is first time we're doing a live event of this kind, but we hope it won't be the last--we'd love to travel your way in the future. We're super excited to put this show on for you, and can't wait to hear what you think. If you have any questions, please email us directly at tips@tested.com or post in the comments. I've also included a show FAQ below. Hope to see you in October! When is the show? Tested: The Show will be on Saturday, October 25th 2014, at 1PM PST. How long will the show be? The show will run for approximately two and a half hours, including a 15-minute intermission. We'll be done by 4pm. What's the format of the show? The show will be a series of presentations, demonstrations, and conversations examining visions of the future through the eyes of makers. Who's going to be there? 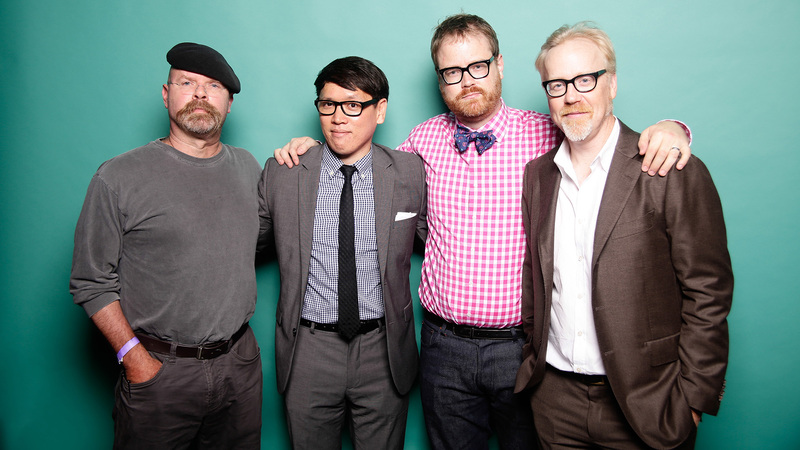 Adam, Jamie, Will, and Norm will be joined by friends of the site and special guests. Confirmed guests include Jeremy Williams and Frank Ippolito, but we'll share more speakers on Tested as we get closer to October 25th. How much are tickets? Seating is grouped into sections, with a VIP section in the front that includes a post-show meet and greet with Tested and the presenters for $40. Most tickets in the Orchestra are $20. What's the Meet and Greet? After the show, VIP ticket holders will get access to a meet and greet area to chat with the Tested team. Will, Norm, Jamie, and Adam. Because we’ll have limited time (around 30 minutes) and want to talk to guests, we request that you not ask for personal photos. We will have a photographer on site, and will post photos from the event (including the VIP) on Tested. Will the show be all-ages? There is no age requirement to attend the show. Like the videos on Tested, the show will be appropriate for all ages, although there may be occasional naughty language. Will there be merch? Yes! You’ll be able to buy designs from the Tested store as well as have first dibs on some exclusive items. Update: Tickets are now open for everyone to purchase! You can buy them here.